This article is about the administrative district of colonial British India. For similarly named places, see Malabar (disambiguation). Malabar District was an administrative district of Madras Presidency in British India and independent India's Madras State. The British district included the present-day districts of Kannur, Kozhikode, Wayanad, Malappuram, Palakkad (excluding some areas of Alathur and Chittur Taluks), and Chavakad Taluk of Thrissur District (former part of Ponnani Taluk) in the northern and central parts of Kerala state. The district lay between the Arabian Sea on the west, South Canara District on the north, the Western Ghats to the east, and the princely state of Cochin to the south. The district covered an area of 15,009 square kilometres (5,795 sq mi), and extended 233 km (145 mi) along the coast and 40–120 kilometers (25–75 miles) inland. The name Mala-bar means the "hillside slopes". Kozhikode was the capital of Malabar. Most of Malabar District was included among the territories ceded to the British East India Company in 1792 by Tipu Sultan of Mysore at the conclusion of the Third Anglo-Mysore War; Wayanad was ceded in 1799 at the conclusion of the Fourth Anglo-Mysore War. The region was organized into a district of Madras Presidency. The administrative headquarters were at Calicut (Kozhikode). After Indian independence, Madras Presidency was reorganized into Madras state, which was divided along linguistic lines on 1 November 1956, when Malabar District was merged with erstwhile Kasaragod Taluk immediately to the north and the state of Travancore-Cochin to the south to form the state of Kerala. 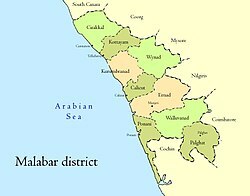 Malabar District was divided into the three districts of Kozhikode, Palakkad, and Kannur on 1 January 1957. Malappuram District was created from parts of Kozhikode and Palakkad in 1969, and Wayanad District was created in 1980 from parts of Kozhikode and Kannur. The name Malabar was not in general use until the arrival of the Europeans. The word is derived from the Malayalam word "mala-baram". Mala in Malayalam means "hill". Varam means "slope" or "side of a hill". In Northern and North-Central Kerala (including all Malabar districts except Palakkad and parts of Malappuram district), where Malabar proper is located, words that start in Southern Malayalam/Tamil with the letter "V" tend to be pronounced with the letter "B". Thus, Malabar comes from the Northern Malayalam words Mala-Bar(am) meaning "hillside land". Malabar Proper extending north to south along the coast, a distance of around 240 kilometer, and lying between N. Lat 10° 15′ and 12° 18′ N and E.Long. 75° 14′ and 76° 56′. A group of nineteen isolated bits of territory lying scattered, fifteen of them in the native state of Cochin and the remaining four in those of Travancore, but all of them near the coast line. These isolated bits of territory form the taluk of British Cochin. Two other detached bits of land within the Travancore. Four inhabited and ten uninhabited islands of Lakshadweep. The four inhabited islands are: Agatti, Kavaratti, Androth, and Kalpeni. The solitary island of Minicoy. The Malabar cuisine depicts it culture and heritage. It is famous for Malabar biriyani. The city is also famous for Haluva called as Sweet Meat by Europeans due to the texture of the sweet. Kozhikode has a main road in the town named Mittai Theruvu (Sweet Meat Street, or S.M. Street for short). It derived this name from the numerous haluva stores which used to dot the street. Another speciality is banana chips, which are made crisp and wafer-thin. Other popular dishes include seafood preparations (prawns, mussels, mackerel) . Vegetarian fare includes the sadya. However, the newer generation is more inclined towards to Chinese and American food. Chinese food is very popular among the locals. ^ Chisholm, Hugh, ed. (1911). "Malabar" . Encyclopædia Britannica. 17 (11th ed.). Cambridge University Press. p. 452. Malabar Manual in Two Volumes by William Logan, first published in 1887, reprinted by Asian Educational Services in 1951. This page was last edited on 20 March 2019, at 04:54 (UTC).